Hope everyone had a safe and great Memorial Day weekend. You all made Joy's birthday, too, with all the orders that we received over the weekend. Thank you! Thank you!! Now it's time to get going on those Father's Day projects that need to be made for those special dads in our lives. Here are some fun things that we just received yesterday from Paper Salon. 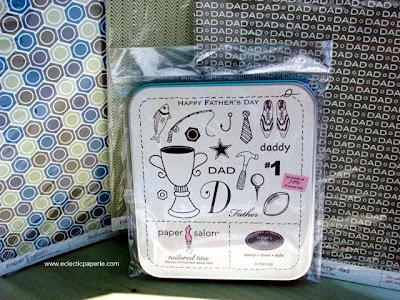 Check out the new Haberdashery line and stamp set called father's day. Way cute and versatile for all those masculine cards and projects that we always seem to not have enough of. The Paper Salon Tailored Tins are very popular since they are die-cut, unmounted rubber stamp sets. They each come in the dvd tin, too. If you are looking for acyrlic blocks for your unmounted stamps, also check out the wide assortment we have . I personally love the Stampendous Acrylic blocks since that have the grooves/handles like traditional wood mounts. If you are looking for any other masculine-type papers, check out the new SEI paperline called Such a Boy and Crate paperlines such as Zoom, Cowboy, and Taylor. The Boy Scouts line form K& Co has lots of designs that can lend themselves to these projects, too. My favorite to give a masculine and also vintage look are Wanted and Halfway Cafe from Cosmo Cricket. The newest line we have from Love, Elsie, called Toby is really hip and cool. Don't forget that we also have a lot of alterables for that perfect gift-giving containers and projects. There are metal tins that mimic the lunch box look and also the clear acrylic paint cans. The DVD tins and CD tins are great items to hold any digital scrapbooking projects you may want to give that special dad. Create a CD of his favorite tunes or a DVD of some great photos with the kids and famiy and put it in some cool metal tin container that you altered. Whatever your projects are for dad or whatever you have planned for the summer, don't forget the great papers and stamps that Eclectic Paperie offers to enhance your creative process and paper crafts. BTW...we have lots of new things in this week. Check out all the new SEI paper lines and matching embellishments as well as the Love, Elsie line from KI Memories.